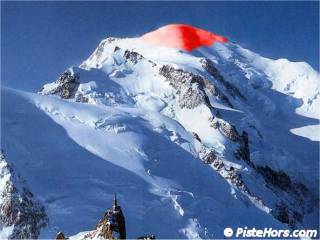 The mayor of Chamonix, Michel Charlet has described plans to paint the summit of Mont-Blanc red as “stupid and illegal”. A Danish artist, Marco Evaristti wants to colour the summit of Western-Europe’s highest mountain with fruit based pigments to draw attention to the pollution in the Alps caused by tourism. Charlet told the AFP news agency that there has been a earlier project to “paint the glaciers blue” by another team and said that Evaristti was a self-publicist. The artist says that he intends to go ahead with his project whether or not he receives permission. Evaristti, who was born in Chile, had previously painted an iceberg red using 3000 liters of colouring. Charlet warned him that “Mont Blanc benefits from the strictest environmental protection” and that a “helicopter landing is forbidden on the summit.” He continued that the project is incoherent, “you can’t protect the environment by degrading a protected area”. The mayor has alerted the Gendarmerie in Chamonix. However, while not agreeing with Evarissti’s stunt, it is the local mayors that have been described as “incoherent” by environmental groups. Local politicians have fiercely resisted calls to class Mont-Blanc as a national park as this would severely restrict increasing the tourist flights and the development of ski resorts at the foot of the 4810 meter mountain. The helicopter ban is moot with groups of skiers dropped just over the border with Italy and Switzerland before descending into France. Mountain Wilderness France has described the mayor of St Gervais as a “schizophrenic” with his calls for a permit system to climb Mont-Blanc while at the same time facilitating access through the refurbishment of the last leg of the Mont-Blanc tramway. There must be better ways to raise awareness than that! It would be a bloody monstrosity. If Marco Evaristti wants to make an effect on global warming, he should drop this crap and start thinkin. Are people still so dumb after many years of global warming. Stop using airplains and heavy polluting vehicles, recycle! Only effect in this dumb plan is on media, which feeds the pollution. People allready know whats going on and how to make a difference. Most of the people in the world thinks only about them selfs. People are greed and willing to do anything, just to be succesfull in life. Thats why we are going to be extinct. What really annoys me is that America is to blame for the vast majority of problems in this world and Global warming is the top of that list, yet they are enjoying record snowfalls this winter whilst the rest of the world suffers. Once again they get away with it and remain ignorant whilst the rest of us can see the full affects of their damage. How come M Charlet let Renault use a helicopter to land one of their cars for a TV commercial on Mt Blanc? As a Chamonix resident I’d love to see Mt Blanc dyed red it would be a lovely contrast to the haze of pollution that lies over the valley after the re-opening of the tunnel and echo the blood spilt for profit there...would make a lovely picture, perhaps with contrails of another eazyjet flight overhead.....what do you think?